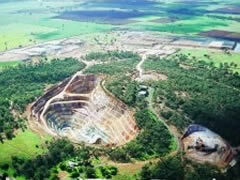 Hydraulic Gold Mining, Pit & Strip Mining? 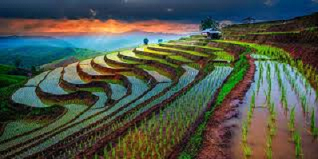 Or Once Farm & Garden Terraces? 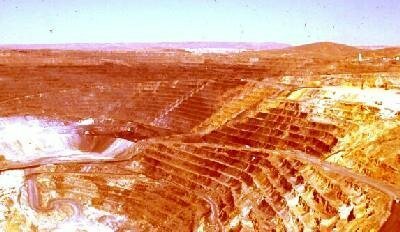 Strip-mining on Mars resembles the Barrick Goldstrike Mine, at right, in Nevada, USA. The young child-face geoglyph on a Martian cliff, photo below, could be a mining ID. 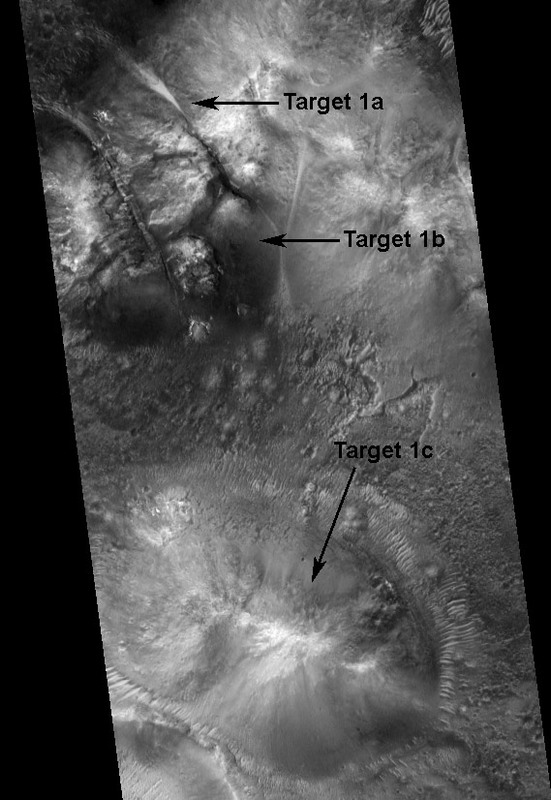 This image, left, taken by the High Resolution Stereo Camera (HRSC) on board ESA's Mars Express spacecraft shows the depression of Juventae Chasma and terraced strip-mine with a landmark insignia of ownership (upper right, arrow at left) cut into the terrain of Lunae Planum on Mars. 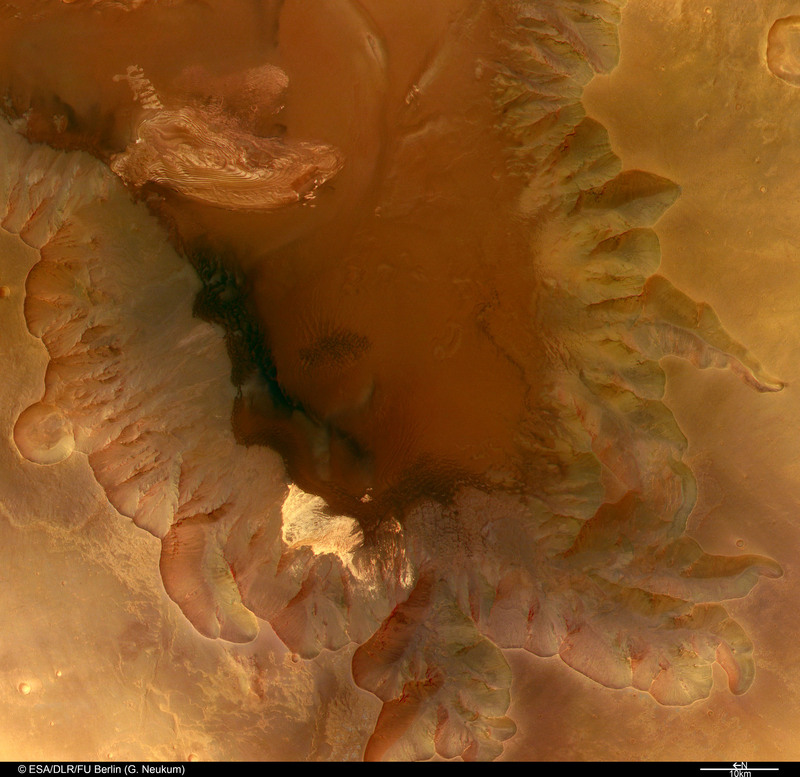 The depression of Juventae Chasma, is located north of Valles Marineris. Another view of the strip-mine and signature from over Juventae Chasma, below, left. <- Note greenish valley surrounding strip-mine in region of Lunae Planum, at approximately 5o South, and 297 o East. This close-up view of the mountain in Juventae Chasma is thought to be composed of sulphates used on Earth in beauty and health aids. <- Symbols at upper left of 'sulphate' mine. To the northeast, there is a mountain composed of bright, layered material. The OMEGA spectrometer on board Mars Express discovered sulphate on the surface of Mars and confirmed that this mountain is indeed composed of sulphate deposits. Very green vegetation shows a real water runoff area. Mars Sulphate Deposits with Dananns signature shorthand script. Close-up at left shows a clear view of super huge signature landmark for spacecraft coming in to mine the planet. 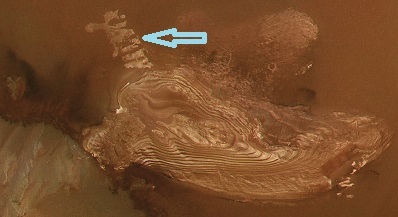 The Mars Express shows the sulphate mine with 'Tuatha de Danann' signature at each end. This signature is the ancient Phoenician script and exactly the same insignia 'WAH' the ancient Phoenicians printed on their Syrian, foundry minted, Cretan coins. A pit Mine here. Another sulphate mining operation? Or placer pit mining of gold? This Mars Global Surveyor (MGS) Mars Orbiter Camera (MOC) image shows light-toned, eroded circular terraces found in eastern Candor Chasma, part of the vast Valles Marineris trough system. 'Formations' like these have been known in Valles Marineris since the 1971-1972 Mariner 9 mission. 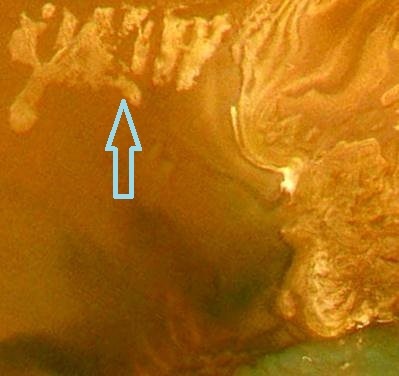 The Mars science community believes they formed in rock that was exposed by the faulting of the Candor Chasma trough, or formed in the trough after it was formed, and is a matter of on-going debates; although each terrace has anciently been filled in with what appears to be the corrugated, plexi-glass-like water tubes which run from the top and around down to the very bottom. Check out MOC. <- Left, Open-Cut Pit-Gold Mine at Peak Hill. No doubt gold was being mined on Mars. 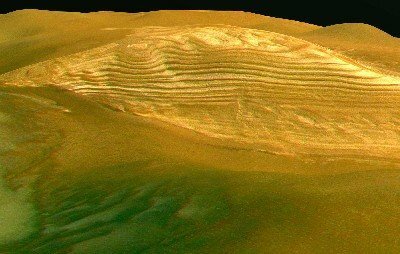 Mars may once have been an ancient El Dorado - a Motherlode. 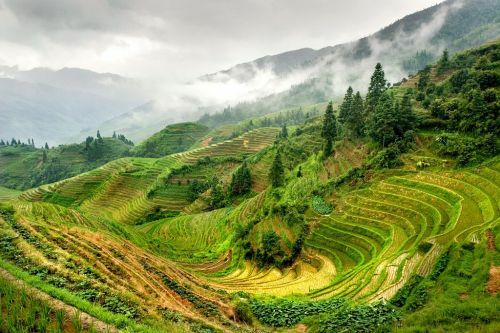 If one inspects the enlarged terraced image above, large tubes encircle every cut ledge right on down to the very wet bottom of this pit mine. Hydraulic/placer mining was being used. Water was being skuttled through tubes across the planet to gold mines; the refined gold in rod form, light weight in space, was shuttled home to Earth. This image was taken by a HiRISE camera on the Mars Reconnaissance Orbiter showing columns of liquid being sprayed out under high pressure toward terrain just beyond. 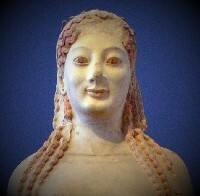 (Target 1a). Also note larger tubes running around an oval formation towards lower left. (Target 1c). Such rounds with large now-collapsed coverings, surrounded by similar large, ribbed-tubes and accompanied by hose-like tubes nearby, can also be seen on the moon. See: Moon 1. The hydraulic/water spray hoses in photo, both appear to be attached to large oval tanks just below them. (Target 1b). The area appears to be a total wasteland of old tubes and tanks running from one end of the terrain to the other, as well as being piled-up, and half buried all over the entire area. Placer mining, i.e. hydraulic gold mining was done on Mars using high-pressure water spray to flush-out gold ore from rocks and soil in which it was embedded. Gold was mined, refined and ingots and other mined resources shuttled to Earth. Gold is the heaviest known element, but virtually weightless in space. It is also high priority for use in electronic technologies. Could some of Mars' archaic, old abandoned plexi-water-tubes still be in use to dredge out ores and other elements? 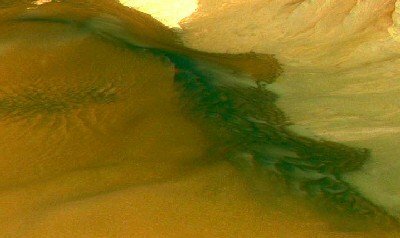 Although most of Mars' water-tubes appear frozen, deteriorated and unusable, some still appear to shuttle water across the planet from the poles and other melt-water places. Since the ancient miners had advanced technology to travel to Mars, refine ore and shuttle them to Earth, it seems if Mars was worth terra-forming, they could have done so given their technological know-how. But like all the ruins on Earth, where the water has sunk many hundreds of feet below the surface, they left it to remain abandoned. Might this have had something to do with the wars, along with their stolen sciences that consisted of much more then just space travel? The very large original of the above MOC photo: m07_m12/images/M11/M1100099 was removed, See: Mars Mines 2 (in progress). 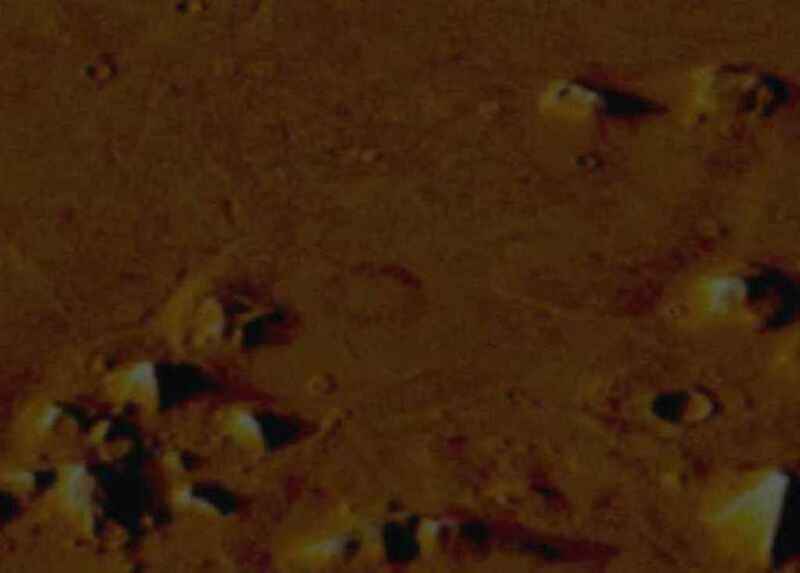 While viewing the original of above Moc image in super magnification, 600X, plus, one could make out humans walking and sitting around the trashed ancient site near giant rope nets, while two high-pressure plexi-tubes spew out water, which can still be seen in smaller photo above, target 1a. Target1b points to the humans. Their uniform tops are white with dark color pants. The tops appear bulky as if wearing oxygen tanks underneath? They also wear what appears to be tight, white head caps that may be fitted with headsets and oxygen masks? The large MOC photo-cut above of these explorations, was taken on Mars, and published in 2001. Possibly taken earlier in the late 1990s. Ancient model of a Jet-Rocket above; found and kept in the Istanbul Museum. Martian smelter structure on left in outline? 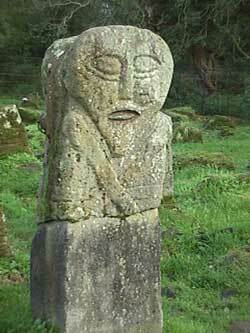 In center an archaic Danann grave in UK, and on right, her 'Lady~Ship' Danann Kelt: Greek/Etruscan-Basque/Egyptian/Asian, 'Daughter of Sun'..et al.